Today is 9-11-2015. It has been 14 years since that tragic day, when so many lost their lives to a senseless attack on our country. That horrific day will remain with me till I die as it will with so many. I live in a small town and we are a proud little town. Today was not another day for us. My town made a huge statement today by having a 3 day memorial for those that have lost their lives in 9-11 and to the fallen soldiers that have lived in our county and state. We have a memorial park called Freedom Grove Park. It’s located at the edge of town so everyone that drives by can view. 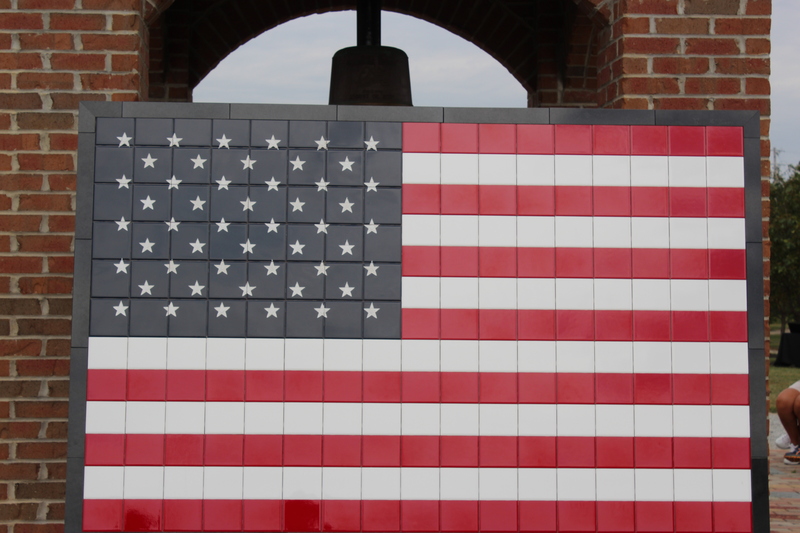 The walkway of the park is paved with bricks that have soldiers name engraved that have served or are still serving and live in our county. 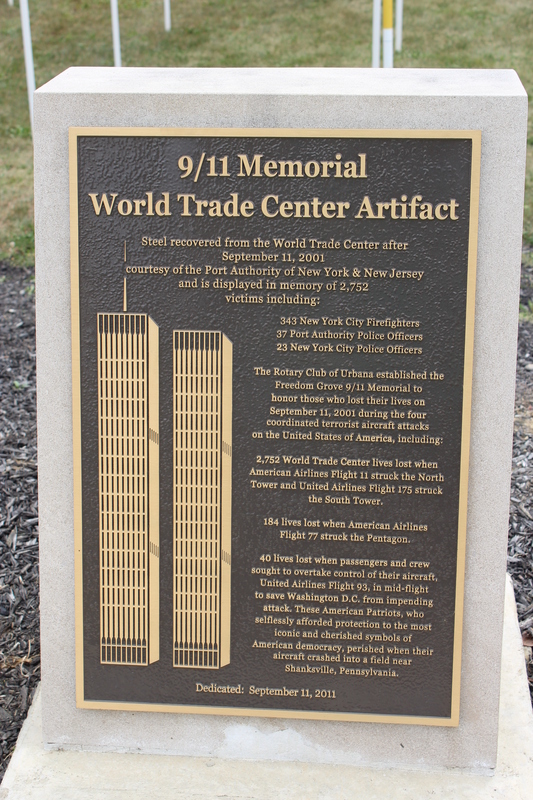 There is also a monument that is a piece of the Twin Towers. It is the center of the park and it is lit up every night for all to see. Today our community did something special. 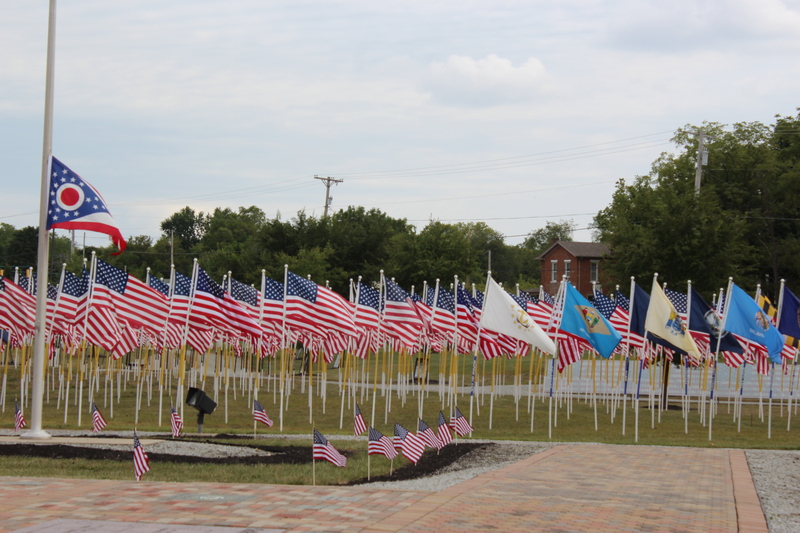 Around the monument was placed over 290 flags. On the staff of each flag was a name of an Ohio soldier that lost their life in Iraq and Afghanistan since 9-11. Seeing all these flags with a soldiers name was heartbreaking. Knowing that anyone of those could have been a relative of mine, it hit a strong note with me. They also filled the park with smaller flags. In total there are over 750 flags flying in this little park. There were photos of soldiers in large frames placed around the trees of the park. 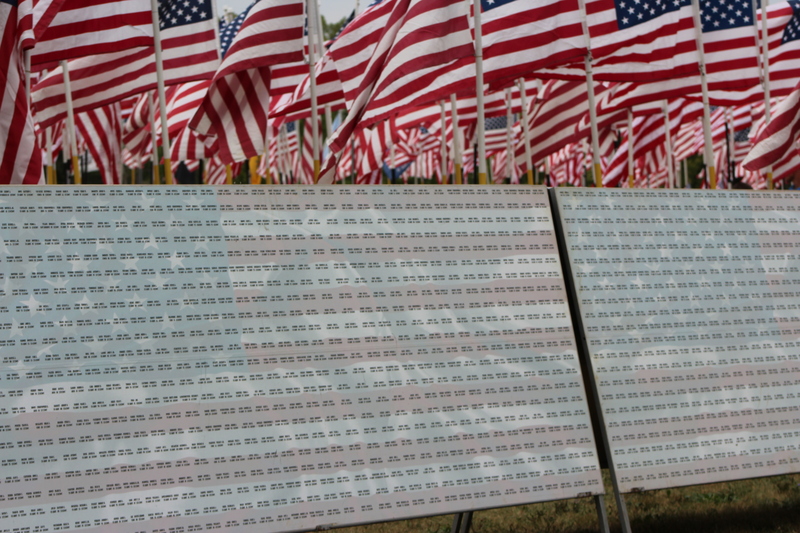 There was a large mosaic of the American flag and 3 large signs that held the names of the people lost on 9-11. There was patriotic music being played as you walked around the park. I was already choked up before I started my walk around. As I walked the park I would take a few steps and take some photos and read a sign or look at some pictures. With each step I was overwhelmed with sadness and pride at the same time. Sadness, knowing that every name in the park was of someone that lost their life. Knowing that there are families and loved ones attached to each name. Pride, knowing that each fallen soldier made the ultimate sacrifice for our country. Pride, knowing that those attacks on 9-11 made our country come together for the greater good. 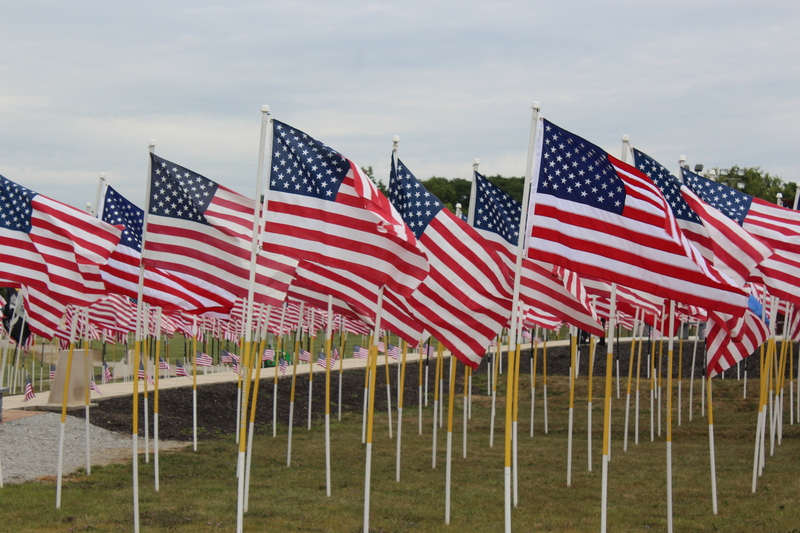 As I stood in the middle of the flags the only sound I heard were the flags waving in the breeze. This sound blocked out the music being played and the highway nearby. To me this was a beautiful sound. Each and every flag whooshed around with a snap as the air carried the flag to be extended, stand tall and proud. With each whoosh and snap I heard, it brought a smile to my face. I do love my country. 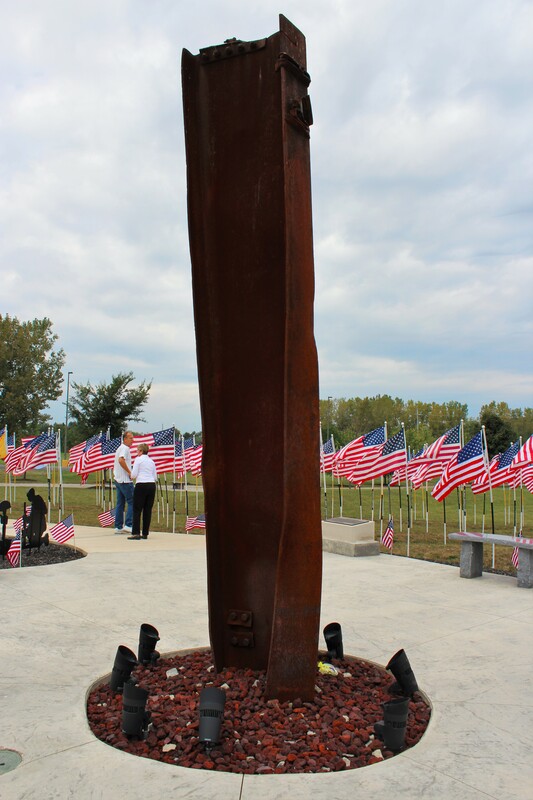 I ended my walk with the 9-11 memorial of the piece of one of the Twin Towers. 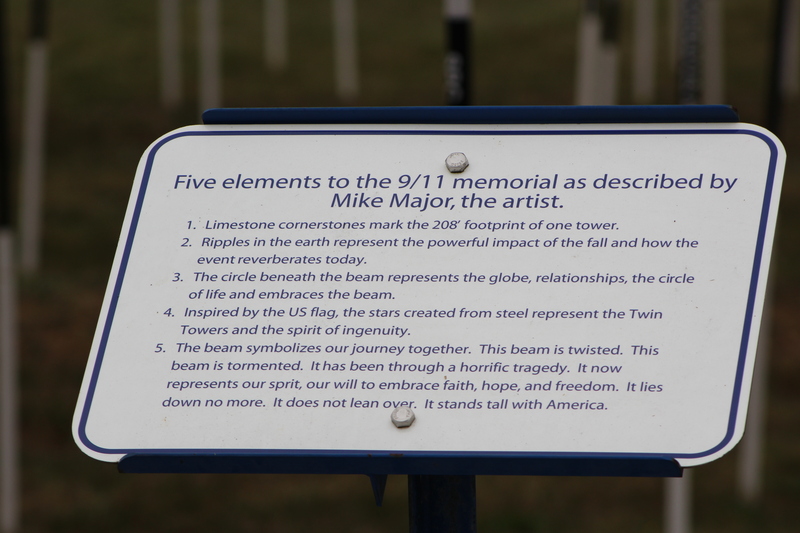 As I gazed upon the piece of steel beam that is twisted and eroded, sadness overcame me. My heart sank into my stomach. Remembering that horrific day and thinking about all those terrified, helpless people. I began to cry for them and their families. I will never be able to image the pain they have and still endure. I was taking my last few pictures when I nice looking, very fit young man, was walking towards me. As he passed me, I noticed his military tattoo on his calf and I asked him if he was a service man. He softly answered, “Yes, ma’am. I then said “Thank you for your service”. His response was surprising because he stated, “no Thanks needed, ma’am. I quickly responded by saying, he deserves everyone’s Thanks because he made a choice to serve our country. I continued talking with him and reiterating my Thanks to him. He then kindly accepted the well-deserved Thank You and went on his way. It’s that type of humility our service men and women have. These folks don’t see that the choice they made to serve as being a big deal, it’s just something they had to do. Just like those police officers and firemen that went into the towers. They were doing their jobs. If it weren’t for those brave and courageous men and women on 9-11 many more lives would have been lost that day. As you head to bed this evening, say a prayer for the families and friends that lost a loved one on 9-11-2001. I know I will. The next time you see a police officer, a fireman or a military person, tell them Thank You. They put their lives on the line every day to protect us. They deserve our respect and our gratitude, because I know I couldn’t do any of those jobs, could you? Categories: Adventure, Memorial Day, My life | Tags: 9-11, 9-11 memorial, Freedom Grove Park, gratitude, In Memory, my life, remembering, Thank You | Permalink.